Whisk eggs with finely chopped onions, green onions, carrots until well mixed. Add some seasoning of salt and pepper along with a dash of garlic powder if available. In a lightly greased non-stick pan or skillet, pour egg mixture and heat slowly over medium heat. It should take a few minutes before getting ready to flip. When solidified after a few minutes and almost cooked through, top with cheese in the middle. 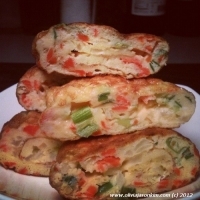 Roll omelette into a tight roll by lifting one side with a spoon or spatula until fully curled. Transfer to a cutting board and let omelette rest for a few minutes to cool. Slice into 1 or 2-inch pieces and serve with cross-sections showing. 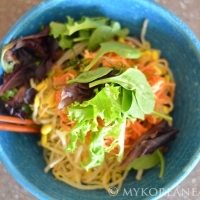 Like oliviajasonkim's recipes? Never miss an upload!